At the moment, SavingsPinay, have already covered some of the most important concepts in Personal Finance. It all started with one single blog post way back 2013 and now we are nearing 228 published blog posts to date. I am very particular in picking topics that should be published in this blog. I guess one topic idea that I can discuss in my other blog IzzaGlino is how my blogging process goes. Anyhow, I thought it will be great to focus today’s topic in one of the fundamental concept in the world of personal finance. Out of my 228 published posts only 10 posts are related to this subject so I decide to really give emphasis on the Importance of Saving. I remember once nakasabay ko sa jeep yung classmate ko nung highschool. He then opened up to me that he don’t have any savings. His money goes 100% to his Mom and then his mom will budget for him. I am not against the idea of letting your mom handle your money BUT… if the topic of “zero savings” occur, I am very furious. As a person who learned through hard way in taking care of her finances and giving significance to the power of savings, my experience has been eye-opening. I experienced having “sakto lang pampamasahe” moments. I also lived a “magastos” lifestyle with my ex-officemates that is I am still regretting up to now. I blame others with my wrong doings and will continually become depressed every time I realize that my expenses and my savings has huge difference. That time I thought that it was too late for me to realize how foolish I taking for granted the money I could have saved. Then came my wake up call. It was when I decided to blog about my personal finance that I learned a lot in terms of money management. The birth of SavingsPinay made me be the Izza Glino version 2.0. I found myself enjoying reading business and investment books. I read PKuntento Ka Na Ba sa Kaperahan Mo? !, You Can be Rich and more. Then I decide to follow other bloggers who are into the financial niche. They say that you have to be with the very people that you want to be. But the first step is always the hardest. Once overspending become your habit it will be very hard to let go. I end up making excuses and reasons why I deserve a treat thus the why created Things that Ruin my Budget Part 1 and Part 2. Then I take everything as slow as possible. One step at a time. I brought my own baon or will find ways to be thrifty when it comes to where I am eating. I started researching of a budget that works. I also learned to apply what I preach in real life. Not only did I successfully manage my finances but I also found out saving as early as now is the only way that you will secure your path to financial freedom. One main excuse why people don’t bother saving money is “eh wala na naming masi-save sa dami ng gastusin”. I’ll tell you honestly today that no matter how much your current expenses or debts is there will always be a tiny little amount of money that you could save. Change your lifestyle and think about the long term. I had this post called Want More Money, Cut Off on these 6 Financial Traps you can read things or items that you need to stop spending too much. Having the discipline to cut off on Alcohol, Cigarette Smoking, Newspaper, Coffee, Load and Fast Food/Snacks… will lead you saving more than how much you have expected. Over time that I’ve been blogging and chasing financial freedom I learned that saving money is far more important than any other concept available. 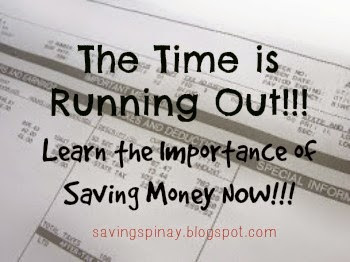 Learning how to save means valuing all your hard earned money and becoming aware of what your priorities should be. Saving Money makes you sleep peaceful at night. If you don’t have reserved money you will end up becoming afraid of what tomorrow will bring. Without saving enough money you’ll pretty much worry how to survive the coming work week. Once you set yourself of having a proper saving by living within your means or taking other extra steps your financial stress will diminish. Picture a life wherein you continually save for goals, you have already opened a saving account for your future children’s education and you are regularly investing in your retirement then I bet you’ll have the best sleep every night. Read: The Ultimate Secret to Save Money. 2. Saving Money will Empower you to have Better Control of Your Own Destiny. Having proper savings will empower you to make financial decisions that will better out your life. The more money you have, the more options you'll be getting. If you are not happy in anymore in your present career then you can easily decide to file a resignation for you have enough emergency fund to use for your expenses. You can now slowly build your dream house, dream car and dream vacation. You can aim higher in life and have greater chance of achieving each goal you create. Read: How to Save Within Your Salary. As part of what I've learned during the Series 1 Seminar at IMG Wealth Academy, a powerful way to start acting for financial freedom is to Save and Invest. First save enough money as your contingency fund aka Emergency Fund. From then slowly save again another amount but this time ride an investment vehicle that satisfies your characteristic. You can choose a mutual fund, direct stock investment or put up your online business as your very first investment. (Read: 15 Smart Ways to Earn Extra Income). If you regularly save and invest then there is a better chance that you can retire at an early age. The accumulated interest that your savings and investments will earn can be the very money that will be working for you which describes Passive Income. Again, start as early as possible because the earlier your start the larger your money can get through compounding. So what are you waiting for?! Save Now and Enjoy the life that you have been dreaming of later. Always assess your priorities and try to live within your means. Remember that Saving is Not About Being Selfish.